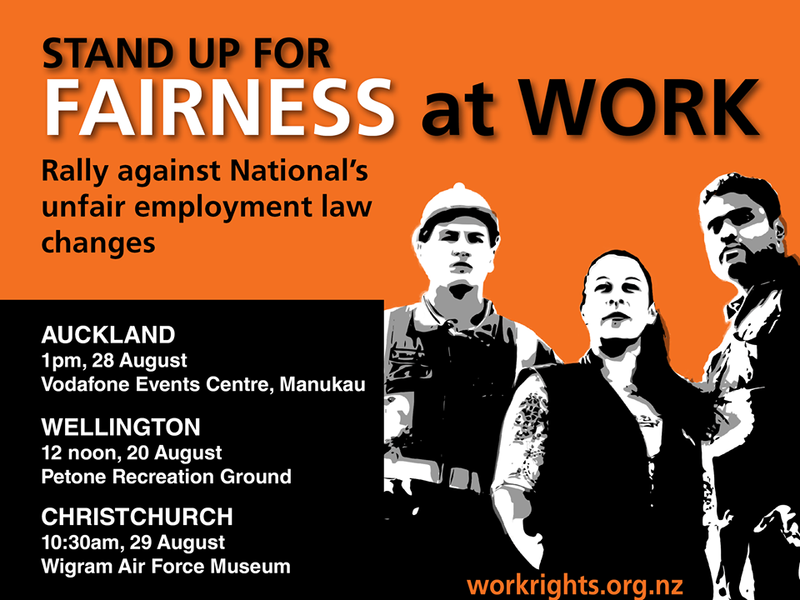 In the UK the fact that an estimated one million workers are on zero hour contracts has become a national scandal. In the USA there is the beginnings of a widespread revolt against insecure hours and low wages with nationwide strikes planned for yesterday. 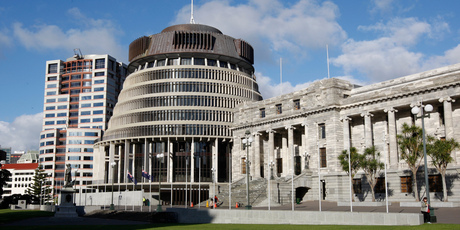 The GCSB bill is due to be passed into law on Tuesday by a single vote. The conventional wisdom is that opposition to the changes is a beltway issue, which means those in Parliament (and the press gallery) are the only ones who care about it. After all, most people want the State to have the tools to protect its citizens from harm. That’s what John Key is hoping will carry that day. 1. Extending State spying powers has always been by political consensus. Labour’s David Shearer and NZ First’s Winston Peters have both said they were prepared to compromise. Their suggested amendments seemed reasonable. But Key is having none of it. Why? 2. The Law Society, the Privacy Commissioner, many respected jurists, and even a former GCSB boss oppose it publicly. When New Zealander of the Year Dame Anne Salmond says anyone who supports the bill has no right to turn up to Anzac events, then the penny must drop for mainstream Kiwis. 3. Key can now only get it through by Peter Dunne casting the determinative vote. The hypocrisy of Dunne supporting spies getting access to citizen’s emails, although he claimed personal privacy when refusing to give up his emails after he was accused of leaking classified documents, is contemptible. John Banks has already sold his party’s libertarian principles and supports the bill. Key now endorses the Act leader for Epsom at the next election. Join the grubby dots. No doubt Dunne will get endorsed for Ohariu once the vote goes through. 4. What happened to Kim Dotcom can happen to anyone. The raid on his house and the incompetence and covering up afterwards should be disturbing to every New Zealander. The bill gives more power. 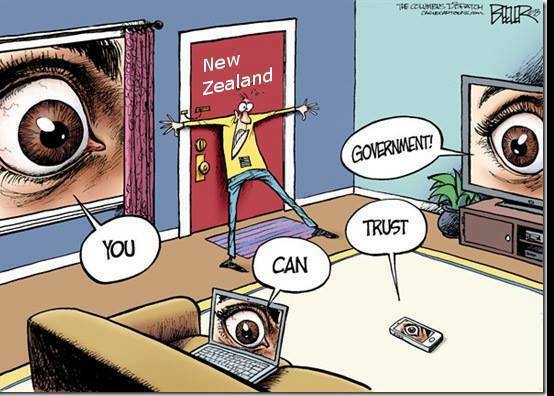 The GCSB spy system is linked into the US and UK spy network so foreign spooks will, in my view, be able to access our citizens’ information, too. 5. It seems a week doesn’t goes by without confidential personal information on individuals being leaked by a government department by incompetence. We have even had Cabinet ministers and ministry bosses happy to expose personal details of clients or employees when it serves their purposes. The temptation to use personal information against individuals will always be there. 6. There’s something scary about a politician deciding who gets spied on. When I was a teenager the then-PM Robert Muldoon released a list of his political opponents he said were being investigated by the Secret Intelligence Service. The smear was deliberate. Will a future leader use such information for political ends? You bet. When civil society is potentially threatened, citizens need to register their concern. 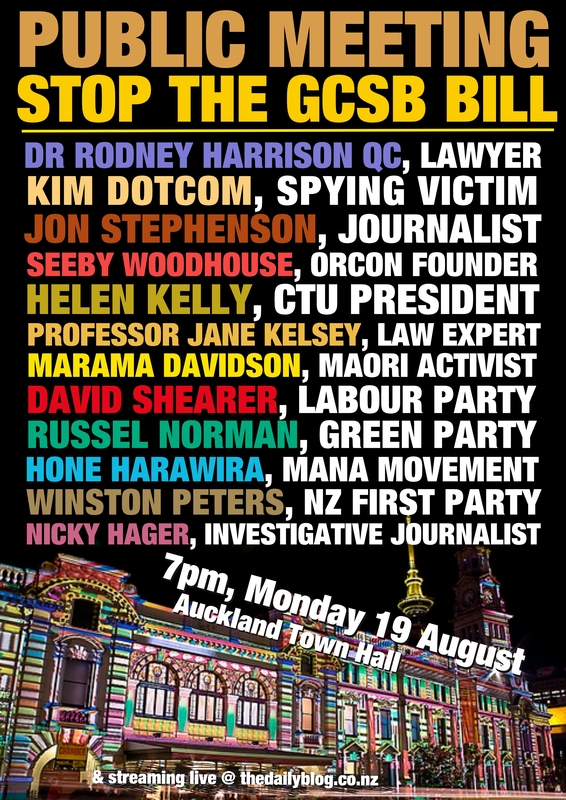 Tomorrow at 7pm opponents are meeting at the Auckland Town Hall. Sometimes it’s important to send a message. Quite rightly, the main news over Fonterra’s infected products has been the physical threat to the customer. Or more importantly, the children of its customers. Once the headlines recede – and hopefully no one dies – the more damaging effect to us collectively is economically. A mate told me this week that his girlfriend’s small milk product business to Asia was in effect destroyed overnight by Fonterra’s public relations train wreck. She won’t be the only one. I have no doubt thousands of other people, and not just farmers, are going to be hit financially – now and over time. We are led to believe that the titans who run our giant conglomerates are infallible gods. In the case of Fonterra, although it’s owned by Kiwi farmers, it seems locals aren’t up to sitting in the executive suite. The latest chief executive has a strong Dutch accent. He probably doesn’t know what a Swanndri is and I’m sure his suits are made of the finest European cloth. But he must be a genius. After all, why would they pay him $100,000 a week? If I were a Fonterra shareholder I’d want my money back. Would you be surprised if in a few weeks we find out that the cause of the infection was some miserly cost-saving measure foisted on the cleaning staff or contractors? The 100 per cent Pure NZ brand was always opportunist marketing. The smugly branded clean image it projected was never actually true. Now it’s being lampooned in international publications and many of our export businesses will be affected. The economic fallout could run into billions of dollars. Every New Zealand exporter of foodstuffs will have their foreign competitors whispering to any potential client that our country’s health and safety regulations are a bit shonky and fail to protect people. What hurts is that it’s true. The Pike River mine explosion is the obvious case where a corporation was allowed by the Government to ignore safety regulations – and 29 miners paid the price with their lives. The Council of Trade Unions has been unsuccessful in trying to get the Government to intervene in the forestry industry where, in just five years, 23 foresters have been killed and nearly four a week injured, many seriously. But you’d expect this Government to put workers’ safety behind corporate profits. They don’t seem to care about consumer protection either, though. Remember the scandal of cheap Japanese imported cars when it first was exposed? After initially pretending it was only isolated rip-offs, the Government was forced to investigate. It found that the Japanese keep detailed records of their cars. It was soon evident that thousands of cars had had their speedometers wound back by tens and tens of thousands of kilometres. It was a colossal billion-dollar fraud against New Zealanders. It was all swept under the table because the Government at the time was in one of its cutting-red-tape campaigns and it was embarrassing to have their ideology weakness exposed. The biggest example of the free market letting our people down, however, is sub-standard timber being permitted when building homes. If you ever need an example of the free and unregulated market working this was it. The market corrected itself all right. Builders were broke. People lost their homes and in several cases took their lives. Government washed its hands of it. Council inspectors washed their hands. Taxpayers, ratepayers and home owners picked up the bill. Lawyers and bankers got rich. Our shonky management at the top hasn’t hit our reputation overseas until now. Fonterra’s emperors have been exposed to the rest of the world without clothes. Our political and business elites keep messing things up with impunity. Meanwhile the little people pay the price. 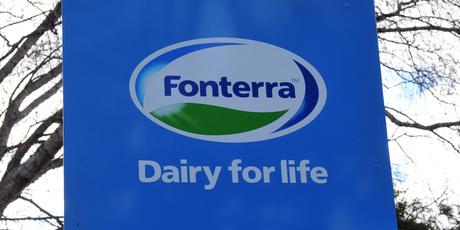 Fonterra is just another example. My conclusion is no after having been a participant in the Alliance Party’s implosion after attempting to do so from 1999-2002 as part of the Labour-led government. But that does not mean that a minor party can’t be an effective player in parliament for reforms while continuing to build a movement outside of parliament as well for real change. Pressure always comes on the smaller more radical party to oppose the more right wing parties and support the “lesser evil” of social democracy. Many working people who either have illusions that their traditional party will make real change, or simply accept – albeit unenthusiastically – the reality of lesser evilism will also often want their party to ally with parties to their left rather than their right in the hope of more progressive policies emerging. It is always worth remembering that not all Labour governments are a lesser evil. It would be hard to argue that was true for the 1984-90 Labour government. Alliance leader Jim Anderton was made deputy prime minister and three others got cabinet posts but the party essentially disappeared from view into Labour’s embraces and it’s policies were seen as essentially the same. The government remained reasonably popular but the Alliance Party’s support collapsed in the polls. Technically the party retained the right to differentiate its own position from that of the larger partner while remaining in cabinet but this was rarely invoked. Then when the decision was made to send troops to Afghanistan it provoked a bitter internal fight with the vast majority of the party rejecting the decision by Anderton and a majority of Alliance MP’s to support the government’s position. The Alliance was eliminated from parliament at the 2002 election and Anderton’s faction has simply been absorbed into the Labour Party. The problem for a genuinely radical party is that it only has minority support and cannot impose any significant policy change on a party committed to the existing system. So long as that system is based on serving the 1% them only small and relatively minor progressive changes are achievable. That was the case for the Alliance which achieved the establishment of Kiwibank and Paid Parental Leave and some labour law reforms despite significant opposition from elements in the Labour Party at the time. But these changes weren’t enough to significantly change the position of working people in the country. They weren’t enough to give people hope that unemployment could be eliminated, inequality radically reduced, democratic control exerted over the key sectors of the economy. If the Alliance had remained outside of cabinet it could probably have negotiated for all the changes it actually achieved but remained free to agitate and mobilise people in the streets for the more radical changes that are needed to make a real improvement to the lives of working people. The Greens will face a similar challenge if they can achieve a majority able to form a government with Labour after the next election. The Greens have already taken the first significant steps to becoming a “partner” in running the existing system rather than challenging it when they signed up to the ETS as a mechanism to combat climate change. They know that the ETS, or any other market-based mechanism, cannot make any real impact in combating a threat to humanity that has arisen as a consequence of the free market system in the first place. The Mana Movement, which is in my view a system challenging movement, may also face a similar problem if the election is close and Labour and the Greens (and NZ First?) require their vote to form a government. They too will be in a position to negotiate some reforms that benefit the people who support it as part of a negotiated agreement to allow a Labour-led government to be formed. By doing so they will respect the fact that for now they are a minority party and the majority of the people they want to represent have voted for Labour or the Greens. That democratic choice can be respected. At the same time Mana can retain their freedom of criticism and ability to organise at the grass roots for the generally timid reforms to go further or against any reactionary policies that such a government will inevitably end up promoting. So long as these parties in government are trying to make a system “work” they can’t escape ultimately disappointing their their own supporters because for this system to work it will continue to produce economic crisis, unemployment and environmental destruction. Movements like Mana can then provide a progressive alternative for those people rather than have that disappointment captured by the right. Mcds Clendon always wanting to be the first out of the gates, leads the first strikes of the day on Thursday for Auckland. The strike was lead by their union strong site delegates who organised there own strike in protest at the lack of movement by McDonald’s on there pay claims. 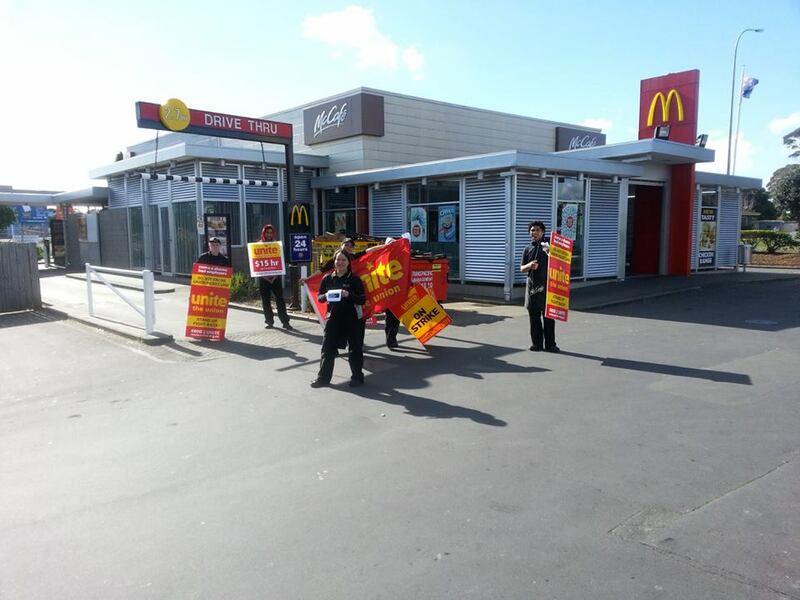 Mcds Clendon had 7 workers who walked off their shift to show support to the Mcstrike Campaign. Of those 7 workers 3 of them had their first taste of a Mcstrike. 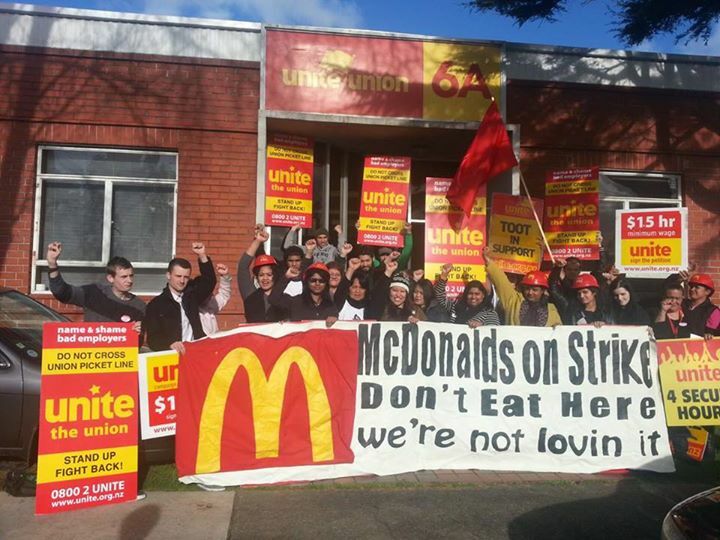 Well done Clendon community who supported by not buying McDonald’s during the strike.